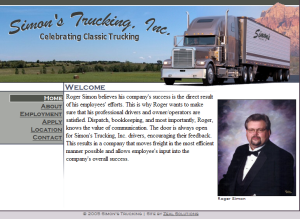 Zeal Solutions Custom Web Services - Portfolio / Simon's Trucking, Inc. Create a website that showed some basic information about the company and allowed for employment applications to be done online. Zeal Solutions created a clean website with easily accessible information about the company. The online employment application is checked before it can be submited to ensure that important information is included. We communicated through phone calls, faxes, and email.